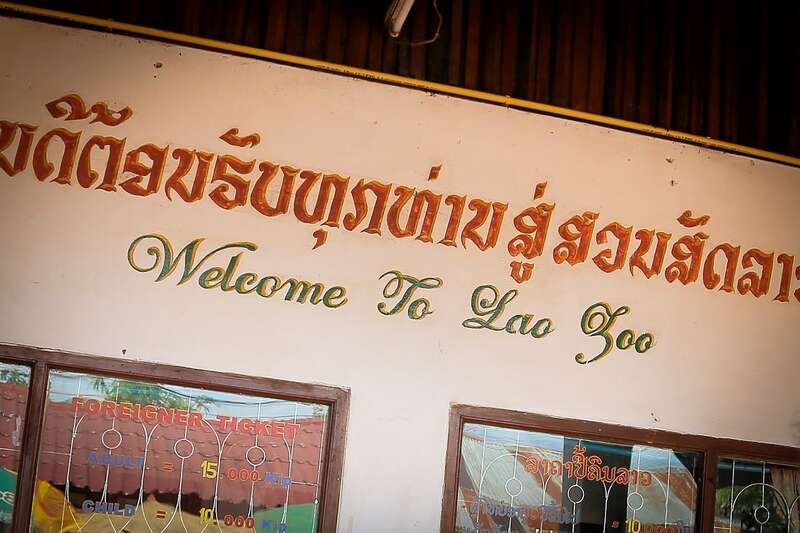 As unbelievable to me as it seems now, I could have easily gone years without ever visiting the Lao Zoo — which I now know would have been a big mistake. We’ve driven right past the Lao Zoo on Road 10 maybe a half dozen times over the past 12 months, with little thought of stopping — and why would we? 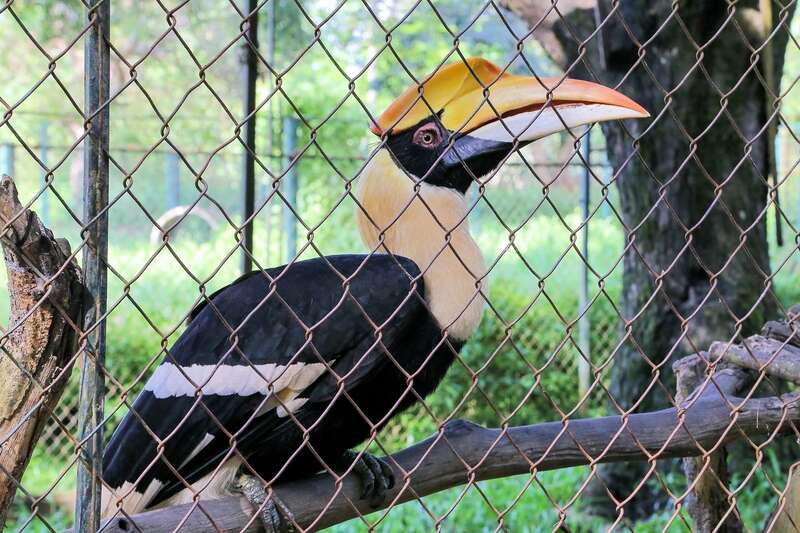 A zoo’s a zoo, and quite frankly, zoos in less industrialized / lower income countries such as Laos can be…depressing. Quite often, captured animals in cages for the enjoyment of visitors in even the wealthiest countries is depressing enough. Add lack of reliable funding and resources to the mix (as is too often the case in lower income countries) and you’ve got the makings of a less-than-positive experience for all involved. 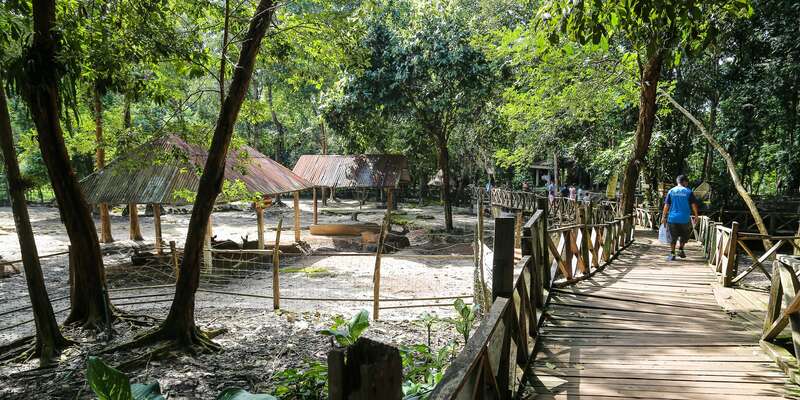 That potential aspect, in addition to the fact that the Lao Zoo is an hour outside of Vientiane and that we’ve heard zero about the national zoo over the past year didn’t place it high up on our “must see” list. Yet, here we were — with time on our hands and a visitor from out of town — passing within a half mile of the place. It was either now or never. I told our eager 16-month-old son that he would get to see animals today, and sure enough, seconds after paying our entrance fee and strolling through the gate, he saw two! — sort of. We saw other parents snapping photos of their kids with two people hidden deep within a couple of brightly colored and very conspicuous animal costumes and thought our should join the fun. The giant chicken and bunny did not protest — they were all smiles (albeit permanently affixed ones). And so was our boy, for that matter! As my wife transferred our son from the giant smiley bunny to the giant smiley chicken, a Lao man with a camera intervened waving his hand in an understated “no, no, no” sort of way. Then it donned on us. Ah…paid photograph booth. We got our picture and hurried right along with the rest of the clueless renegade parents. 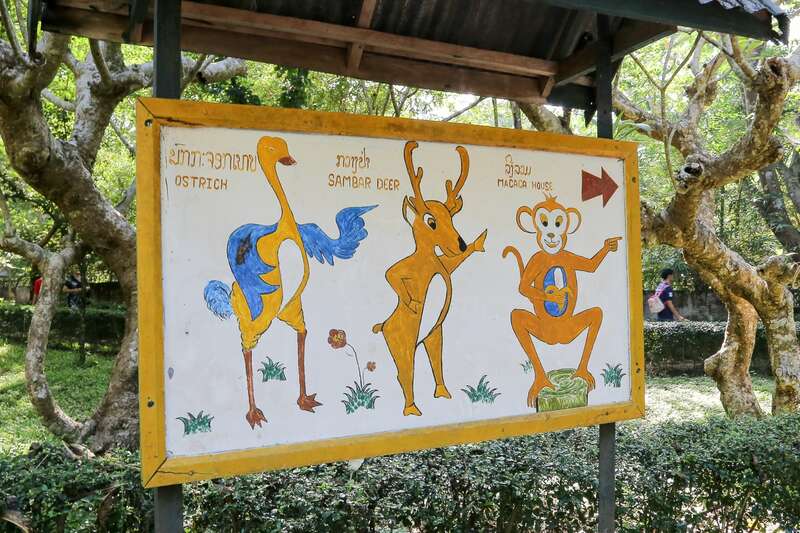 Admittedly, I knew nothing about the Lao zoo when we arrived. In my defense, there isn’t a lot of information provided at the zoo — information is pretty minimal regarding the animals, but also about the facility itself. What actually struck me the most upon arrival was how nice the grounds are. The entire facility appears well maintained—tidy and in good repair. The grounds were also far larger than I expected — they seemed to continue on and on. 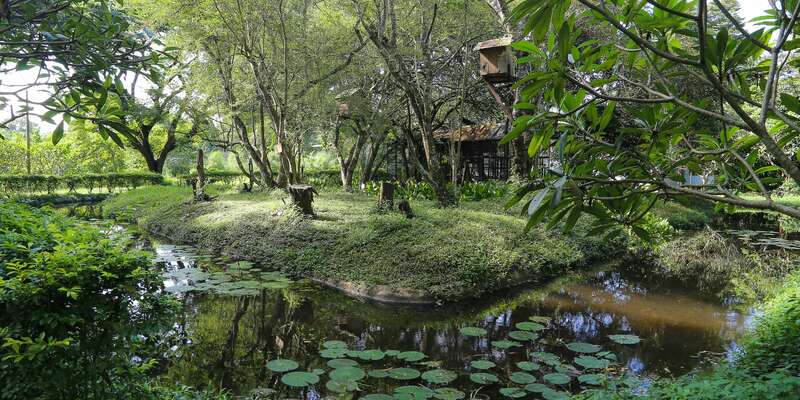 Much of the sprawling facility is set amongst a fairly dense grove of trees, offering ample shade to animals and visitors alike. Visitors proceed around to the various exhibits via a series of elevated wooden walkways. On ground level, native species of underbrush seem to mimic wild habitat. Many of the exhibits are spacious and open (but surrounded by secure fencing). Everything is outdoors here—there are no indoor exhibits. Most animals appeared to be well cared for, though I initially thought some appeared scrawnier than one might hope — I later learned the reason for this, which certainly put a wrench in my initial assumptions. I was also happy to see that, like other smaller national zoos we’ve visited throughout the world, the animals were native to the area — a sort of Tour de Laos rather than attempting to bring the world’s animals to the Laotian population, as is frequently the case in zoos in the U.S.
We proceeded farther down the path until we suddenly came to an outline of a large figure lurking in the nearby trees across a ravine. 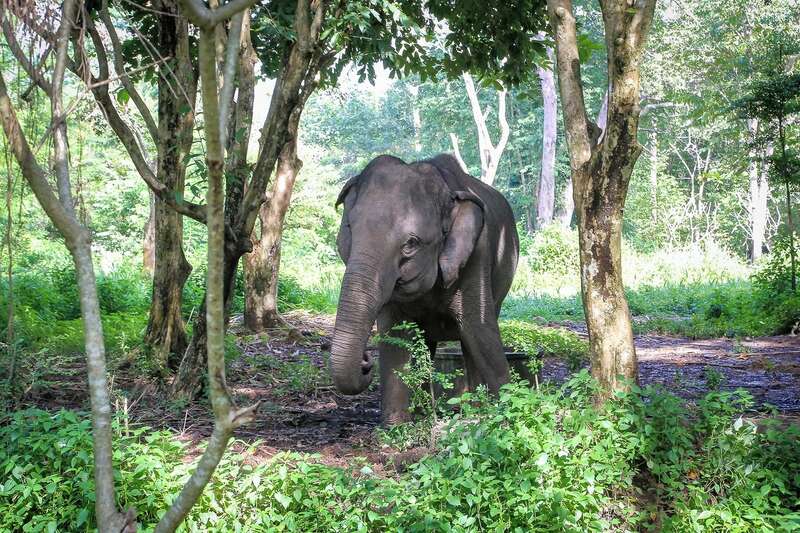 It was an elephant roaming what must have been several hectares of lush forest, just for him and whatever friends he might have deeper in the woods. Owing to the ravine, there was nothing to obscure our view, and the elephant seemed to also enjoy watching the slow but steady trickle of visitors passing by his domain. Later on, we were walking along a fence line when I peered over and caught the eye of a large dark figure, walking upright like a rotund older man and matching my step. Just an Asiatic Bear on an afternoon stroll. We arrive at a rise of crumbling steps off to one side. At the top, a woman was selling something unidentifiable, so we decided to investigate. 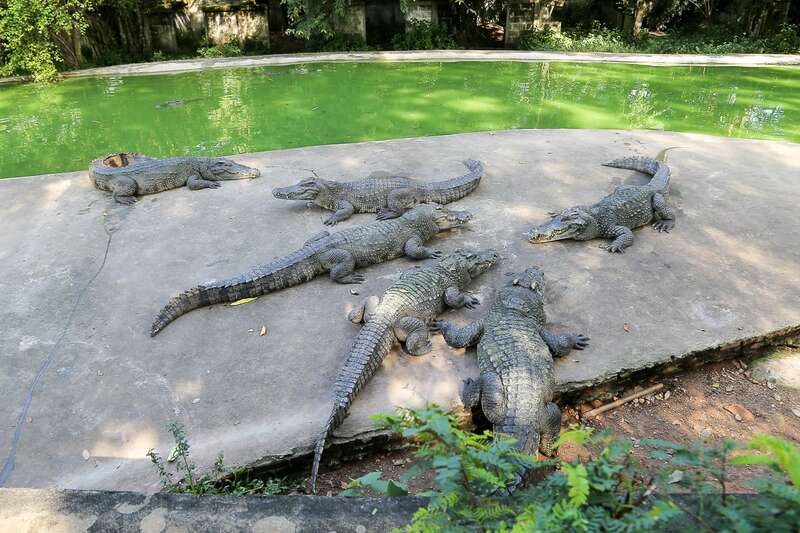 At the top, I suddenly found myself on a concrete platform staring down at a dozen ferocious-looking alligators, mouths agape and ready to feed on anything. The woman parked on the platform appeared to be selling bananas to feed to the alligators—harmless fun, I thought, so I asked how much, gave the woman the requisite amount, and was handed…a set of tongs and a big ol’ plate of raw, bloody, and somewhat malodorous fish guts! Well, all right then. 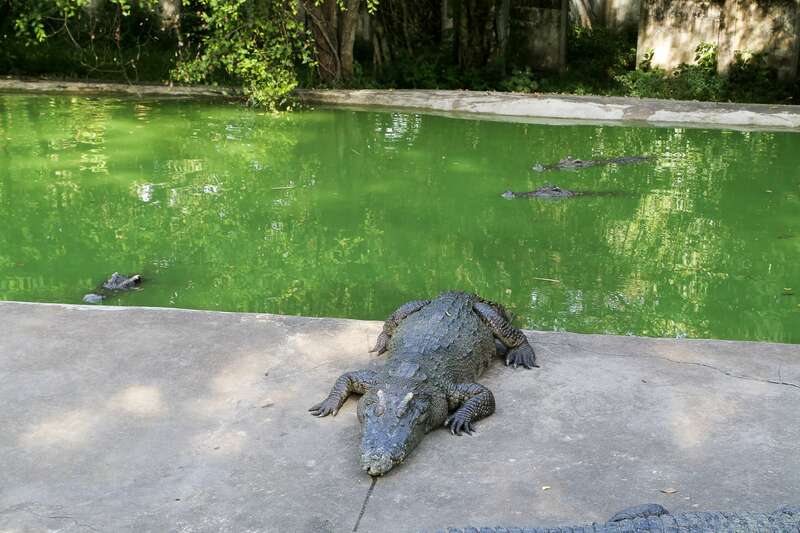 My wife and I proceeded to spend the next ten minutes flicking fish parts into the alligator pit and watching the social order of the pool play out before us. It wasn’t the melee we had anticipated, fortunately, but something quite unexpected. Each alligator seemed to take their turn rushing for the flying treat, and none seemed to take more than their fair share. If only humans were so civilized. 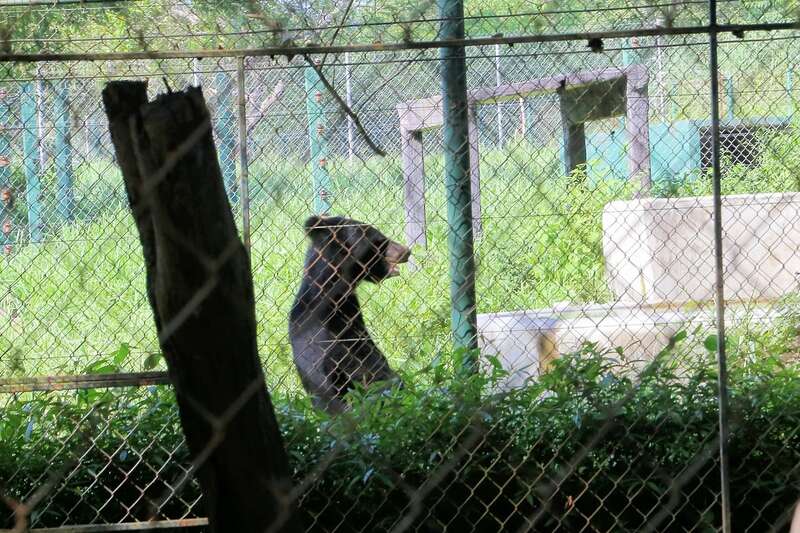 I mentioned in the opening paragraph of this piece that the Lao Zoo harbored a secret—that the facility isn’t actually a zoo at all. Let’s rewind. 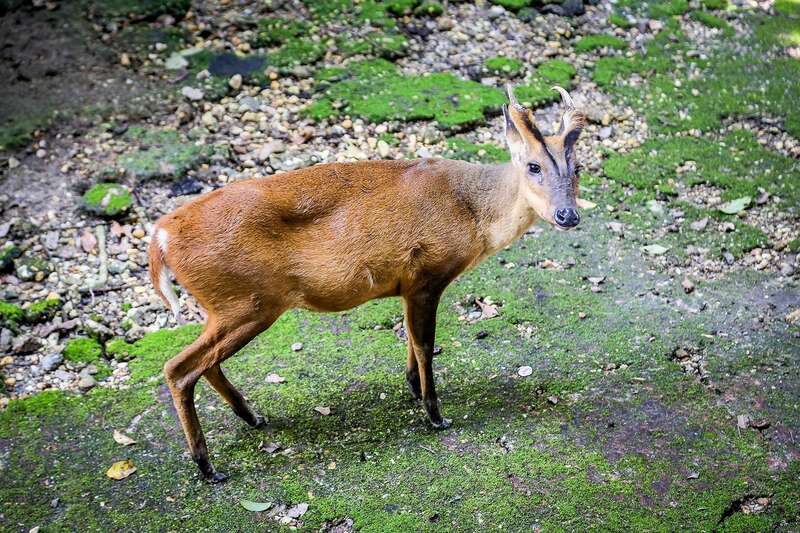 The Lao Zoo was started in the mid-1990s as such—a joint venture between two unlikely zoological advocates: the president of Lao PDR, and the Ministry of Defense, and is still owned by the Ministry of Defense to this day, though a philanthropic Lao-Thai family has provided much of its funding for the past decade. 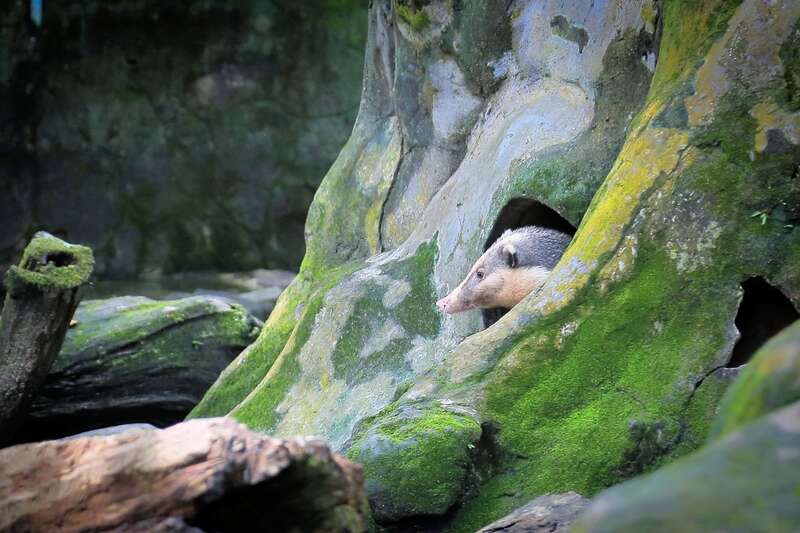 In 2015, however, the Lao Zoo became the Laos Wildlife Rescue Center, a joint venture by the Lao Ministry of Defense and Wildlife Friends Foundation Thailand, and is a member of the Wild Animal Rescue Network (WARN) of Asia. 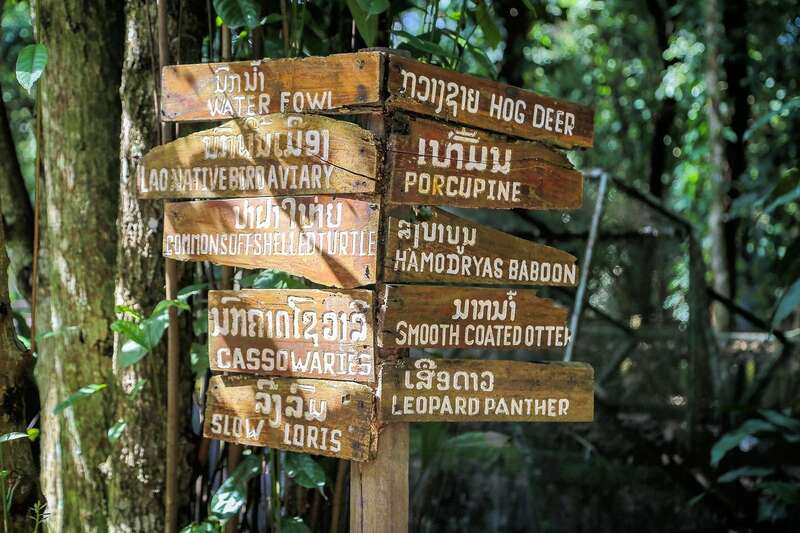 While the facility still holds the moniker “Lao Zoo” (along with related signage) the plan over the next decade is to fully transition from a national zoo to a rescue center, resulting in upgraded facilities and new facilities such as a wildlife hospital and quarantine facility. 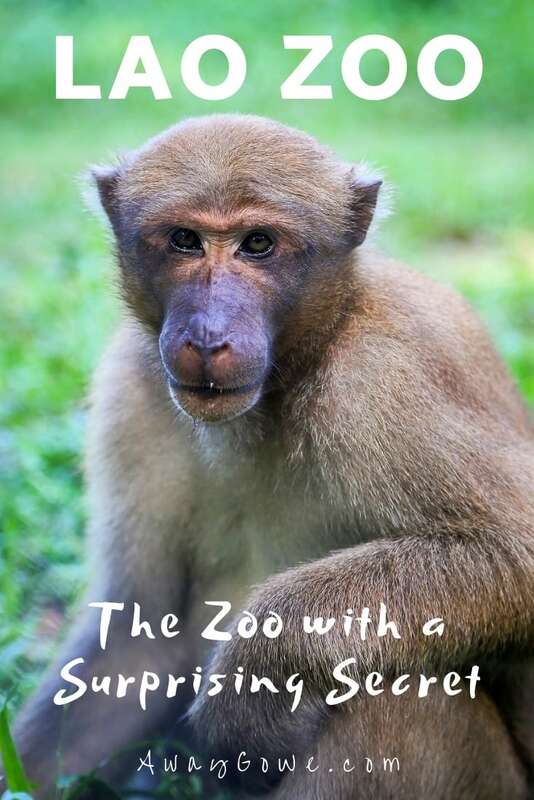 I was surprised to find out that a great many of the animals at the Lao Zoo are rescued animals (previously captive or injured), many of which are being actively rehabilitated for re-release back into their wild habitat. Unfortunately, I was unaware of this during our visit. Learning of these developments helped explain some of the more concerning encounters at the zoo. 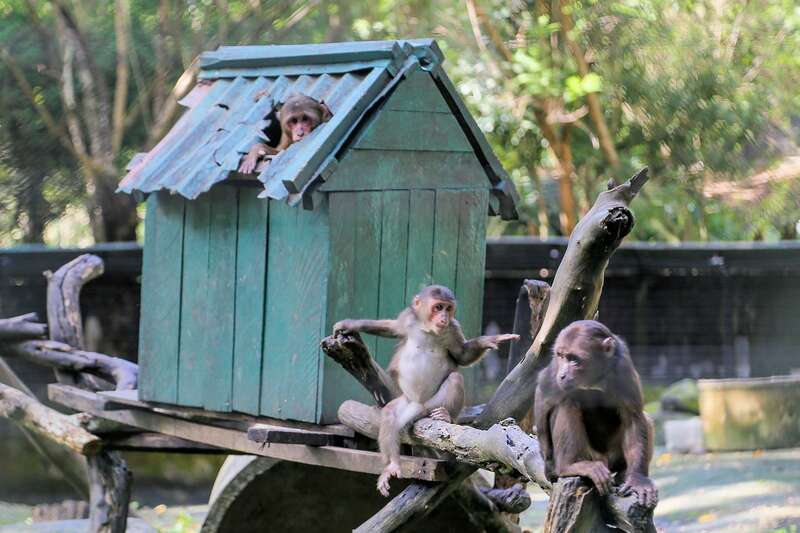 Some of the more malnourished-looking animals have recently been transferred from situations where they had been kept in captivity and not properly cared for. 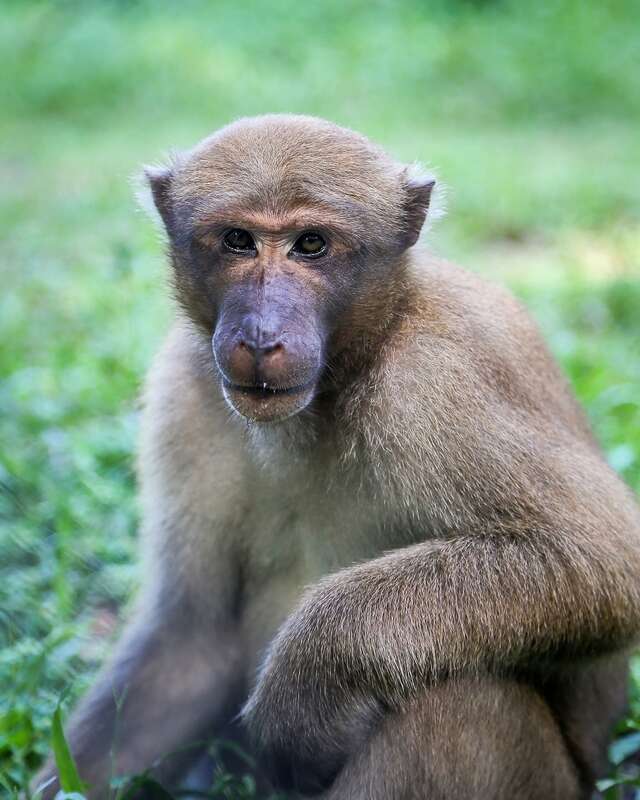 One baboon we saw pacing in a smallish cage had also recently been rescued and was undergoing intensive rehabilitation. Had I known this going into the zoo, it would have altered my view of the facility immensely. The efforts being undertaken here are admirable and should be a source of great pride for the Lao people and a model for other countries facing similar challenges. I am just not convinced many know of these efforts at all. We certainly did not until I did my own reading on the facility weeks after visiting. It would serve the facility quite well to have an information placard regarding the rehabilitation conspicuously posted upon arrival for all to see, which I sincerely hope will be part of the upgrades in the coming years. The hour-long drive back to Vientiane was quiet and uneventful. Our son happily napped for the duration following an eventful afternoon, which left us time to take in the harvest activity and neon green fields that characterize mid-October in central Laos.